Sami Allagui (left) after scoring his vital goal. | Photo: Christof Koepsel/Bongarts/Getty Images. The Zebras brightened up a dull game in the second half, but were downed by the 32-year-old's turn from the bench. 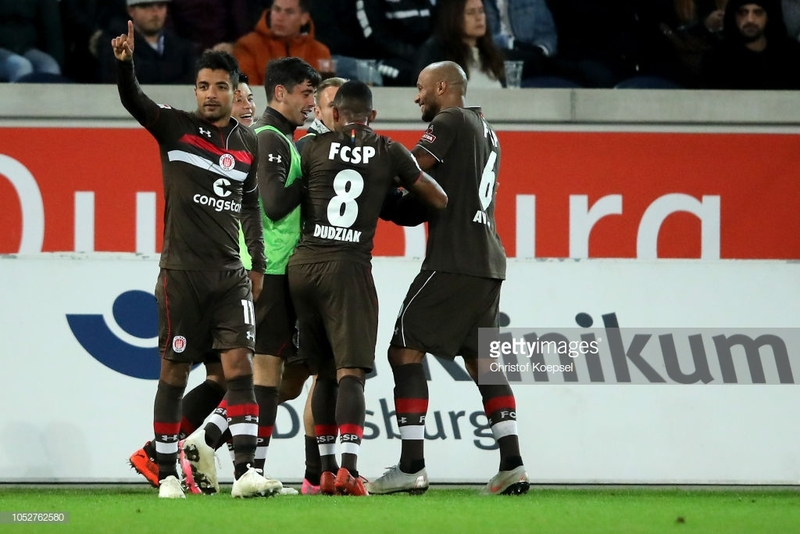 Sami Allagui scored from the bench for the second game in a row as FC St. Pauli beat MSV Duisburg in the 2. Bundesliga. The first half failed to set the pulses racing. St. Pauli started brightly, with Jeremy Dudziak and Marvin Knoll testing Daniel Mesenhöler early on, Knoll latching onto a ball from Christopher Buchtmann. Ryo Miyaichi, retaining his place in the side from the 3-1 win against SV Sandhausen, had a go at goal but struck well over, before Dudziak had perhaps their best opportunity, cleverly finding space to shoot in the box before going wide with the effort. Duisburg on the other hand were mostly restricted to long range efforts. Cauly Oliveira Souza put a chance wide early on, whilst Fabian Schnellhardt and Kevin Wolze both missed from outside the box. Otherwise, they lacked the same energy that had helped them to shock 1. FC Köln two weeks ago. The second half began similarly, although Robin Himmelmann did have to make a save from a Kevin Wolze free-kick played under the wall, with Oliviera Souza off target from range as well. St. Pauli then came the closest anyone had to scoring, from a corner. Headed on by Philip Ziereis, Miyaichi headed it over the bar. Mesenhöler then kept out a long-range attempt from Richard Neudecker, soon after he replaced an injured Miyaichi. The best opportunity of the lot though came for the hosts just after that. Andreas Wiegel took his chance from outside the box, which had the fizz and accuracy to test Himmelmann into making a superb save. Christopher Avevor then hooked the ball away from the face of Ahmet Engin, making contact with the man in his follow-through. Duisburg wanted a penalty, but nothing of the sort was given. Weigel nearly scored with a free-kick as well from some way out. It nearly lobbed over Himmelmann’s head, but he was able to claim the ball. St. Pauli rung the changes, with Henk Veerman volleying a chance wide. Another replacement though, Allagui, would have them ahead, against the run of play, barely more than a minute after replacing Buchtmann. He was left all alone as Knoll whipped in a corner, heading in past Mesenhöler. Duisburg threatened in the closing minutes, with both Stanislav Iljutcenko and Weigel heading Richard Sukuta-Pasu crosses off target. But St. Pauli hung on, and moved into third place above, amongst others, Hamburger SV. For 83 minutes, St. Pauli’s limitations under Markus Kauczinski were shown up here. Whilst very stable at the back, they didn’t seem to have the best combination up front. Kauczinski had stuck with the team that started the win against Sandhausen, even though two of the goals came in stoppage time, when all three changes had been made. The same three players came on here – Veerman, Neudecker and Allagui – and within 70 seconds the latter had put them ahead, even quickly then he had done against Sandhausen. Perhaps they should all start the derby against Holstein Kiel on Sunday. A lot was made about the signings of John Verhoek and Sukuta-Pasu by the Zebras in the summer, but both have struggled to make any impact so far for their new side, part of the reason why they find themselves languishing in the bottom three. Verhoek was virtually anonymous against his former side, although at least Sukuta-Pasu did pose a threat in the brief time he was on the field. Allagui ultimately made the difference, but whilst the game was still a 0-0, Dudziak was one of the standout players for the Boys in Brown. The centre-back duo of Ziereis and Avevor was solid as a rock as well. Weigel was the standout player for Duisburg, although their other full-back Wolze had a strong game as well.